So you’ve finally had enough; you’ve spent one too many nights on the cold hard ground, sleeping on top of rocks and roots, in constant worry of your tent being flooded out from underneath you. You’re finally ready to graduate to a hammock system! 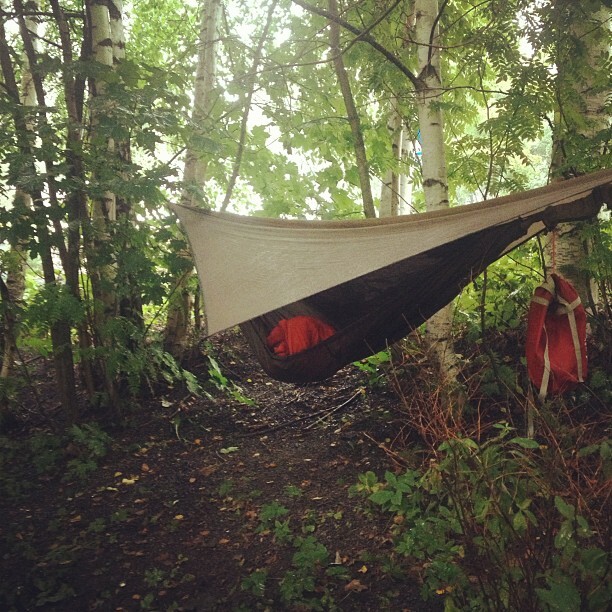 So what do you need to know about transitioning from a tent to a hammock? Bugnet: Pretty straightforward, the bug net is simply a layer of netting designed to keep bugs out of the hammock. It is usually attached, or draped around the ridge-line (see below). Diagonal Lay: Refers to how some hammocks are designed to be asymmetrical, and thus require the hanger to lay diagonally. This is done to achieve a flatter, and more comfortable lay. Ridge-line: A tight cord that runs from one end of the hammock body to the other, and helps regulate the sag (see below) in the hammock. For a visual of a ridge-line, click here. Sag: Relates to the amount of tightness the hammock experiences between the two trees. 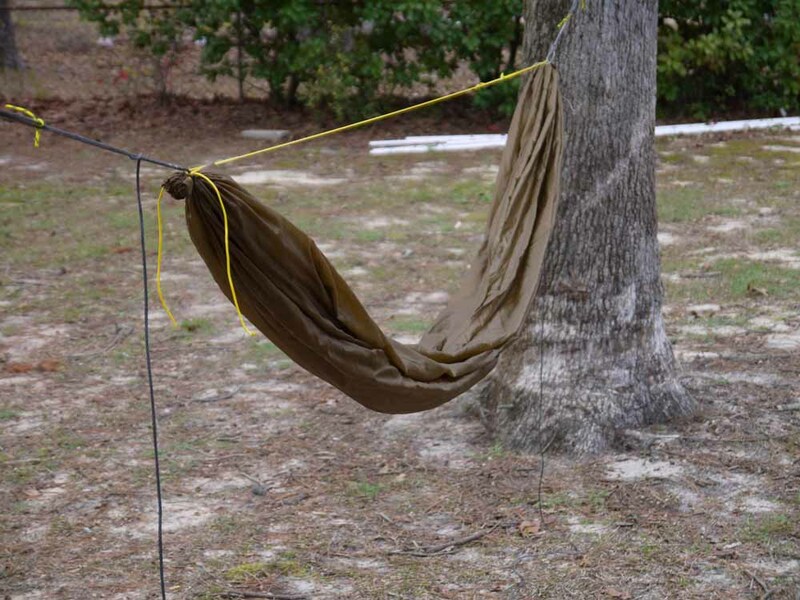 A loose ridge-line allows for more sag in the hammock. Snakeskins: A waterproof, sock-like tube that slides over the hammock, providing for easy take-downs, set-ups, and storage while on the move. Manufactured by Hennessy Hammock. Supports/Tree Huggers: Straps or webbing that wrap around trees, and are connected to the suspension (see below) of the hammock. Meant to support the weight of the hammock, while also protecting the tree. Suspension: The general term describing the system that connects the supports to the actual hammock body. Tarp: In tent terminology, this is usually referred to as a rainfly. The principal is the same; it keeps the occupant dry. 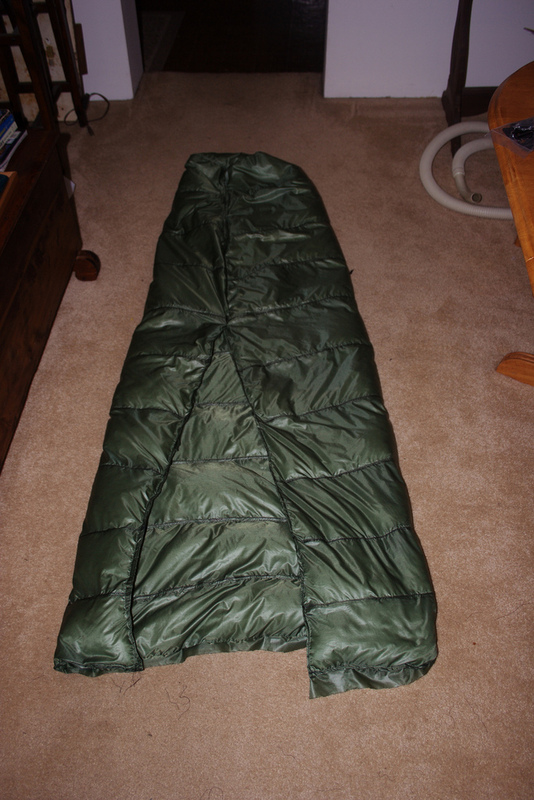 Top Quilt: Essentially a blanket, or a sleeping bag without any back insulation. By eliminating the compressed material underneath the occupants back, it cuts unnecessary weight, while retaining warmth. Under Quilt: An insulation layer that hangs flush against the outside of the hammock, providing needed insulation to the hanger’s backside, while still retaining maximum comfort. These terms are just the tip of the iceberg, although they are the basics that every new hammock user should learn. For a full “glossary” of hammock terminology, check it this thread on HammockForums.net. One of the biggest myths surrounding hammock use is that you don’t need to have anything underneath you while sleeping in the hammock. However, spending a night outside in temperatures below 55 degrees Fahrenheit will quickly debunk this, as hammocks sleep significantly colder than tents do if no bottom insulation is used. So why is this? When you sleep on the ground in tent, your sleeping pad serves as insulation for your body against the cold ground. This insulation is just as essential to keeping you warm as your sleeping bag is. When you sleep in a hammock without any bottom insulation, the airflow beneath you quickly cools you down, as the material in your sleeping bag provides little insulation when compressed against your back. 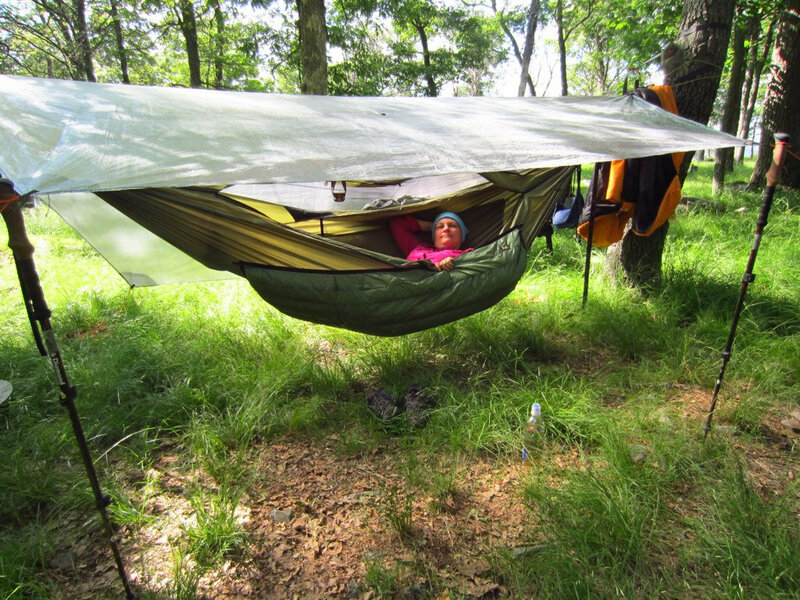 There are two feasible options for bottom insulation in a hammock; a foam sleeping pad, or an under quilt. As was touched upon earlier, under quilts wrap around the underside of your hammock, providing insulation without the need for a sleeping pad. Under quilts are the preferred method of bottom insulation by most experienced hangers. However, if you previously backpacked with a tent, chances are you have a foam sleeping pad laying around somewhere, and may choose this option instead. Pads work great as insulation layers, they just require a bit of practice, and a lot of squirming around to find the perfect position. They also give you the added bonus of being able to sleep in shelters, which would be impractical without a sleeping pad. As far as top insulation is concerned, just about any backpacking sleeping bag will do. However, many hangers eventually switch to a top quilt, which is essentially just a sleeping bag without any back insulation. Top quilts provide the same amount of warmth as a sleeping bag of the same rating, for less weight. I’ve also noticed that sleeping bags tend to create more condensation when used with a sleeping pad in a hammock. This condensation can be reduced by simply using the sleeping bag like a quilt; unzip the bag it all the way down to the foot box, lay directly on the pad, and drape the sleeping bag over your body. Congratulations, you no longer need to scout around the forrest floor, in search of a flat, dry, and smooth spot to set up your tent! Now all you have to do is find two trees, and you’ll be comfortably asleep in no time, right?! Well, the answer to this question is, kind of. It is absolutely true that the campsite selection process in a forested area is much easier with a hammock. And it is also true that, technically, all you need is two trees to set up your hammock. However, a few more factors need to be considered when choosing your home for the night. First of all, not just any two trees will do. The general rule is that one must choose two trees that are between 15 and 20 feet apart, though this varies depending on each specific hammock. Additionally, these two trees must be sturdy enough to not bend under the weight of a hiker’s body, which would alter the lay of the hammock. They must also be free from dead branches above (nothing ruins a good night’s sleep more than a falling branch). Contrary to the manner in which tents are sold, most hammock systems are not an “all in one” package. This means that one must purchase (or build!) some, or even all of the items for their system, separately. This is where, perhaps, the biggest learning curve with hammocks comes into play. You can buy your tarp, hammock, suspension, and accessories, all from different manufactures, and put everything together into one system. This can be a very good thing, as it allows the hiker to personally optimize their set up. However, for beginners, the numerous different options can be very confusing. This relates to why it is so important to learn the hammock vocabulary, as it can be hard to know which gear items to purchase without knowing what half of them mean. 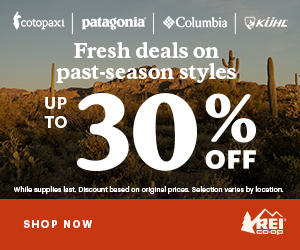 However, despite the learning curve, anyone who is truly fascinated with the idea of switching to a hammock can make it happen, it will just take a bit more work than browsing REI’s website, and clicking “buy” on the first tent that appears under clearance. Fortunately, those who want to switch to hammocks are not completely limited to piecing together a system from scratch. There are some “all in one” options available. One of the most prominent hammock companies on the market, Hennessy Hammock, has many different hammock systems available for purchase. All their different options include a rainfly, webbing straps for suspension, and of course a hammock, with a built-in bug net. As I stated at the beginning, this article isn’t meant to convince prospective hikers to make the switch to a hammock, this article is meant to assist with the transition from a tent. For that reason, it is important to understand some of the minor differences between the two systems; the differences that are usually discovered only after a new hanger uses their hammock for the first time. Most tents have a vestibule, or interior room, for overnight gear storage. Hammocks, however, do not have any internal storage (other than the storage of a weary hiker, of course), so other options must be considered. The option that I choose, is to put everything I need to store inside of my pack, and then put my pack inside of my pack-liner (which is just a standard trash compactor bag) and seal it shut. I then place it directly under my hammock, which keeps it dry if it rains at night. I usually place my shoes right next to the rest of my gear, so they stay dry underneath my hammock as well. 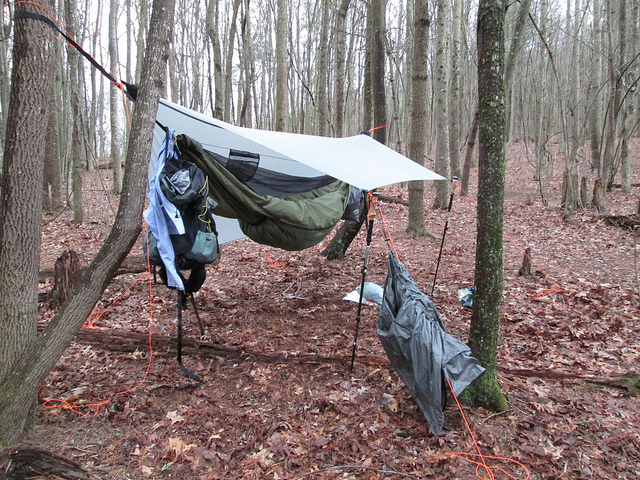 Others use different approaches; some hang their pack on the ridge line of their hammock, and some either bring an additionally hammock to store their gear in! Of course, staying near a shelter will also provide a place to store gear (assuming the shelter isn’t already full). It shouldn’t come as a surprise to hear that hammocks are fairly restrictive. This means that things like changing, organizing gear, or anything else that requires extensive movement, must be done outside of the hammock. This usually isn’t a big deal, unless mother nature is in a nasty mood of course. Additionally, their restrictive nature requires the need for hammock users to squirm around a little bit before settling into the optimal sleeping position. This is especially true when using a sleeping pad as bottom insulation. All in all, making the transition from a tent to a hammock is a worthwhile undertaking. There is a reason for the almost religious following surrounding the use of hammocks for backpacking, and this reason is simple; they are more comfortable, more customizable, and greatly expand the number of campsite choices a backpacker can choose from. Though making the transition does require a fairly significant learning curve, and can be slightly intimidating at times, it is by no means unachievable for the average hiker. I hold the belief that every backpacker is a hammock enthusiast, some of them just don’t know it yet! I’ve used my Hennessy hammock for years. I’m actually on my second one. This is how I deal with the compressed insulation problem. I don’t use and underquilt. Instead I use a Big Agnes system bag. These bags have an integrated sleeve for the air mattress which make it impossible to roll off the pad. You are going to have a sleeping pad any so in shelters. Thanks for chiming in George. I’ve seen those Big Agnes bags with the pad sleeve, they seem like a solid idea! I imagine it helps keep the pad from sliding around quite well. Personally I would probably switch to an under quilt, except for the fact that I do sometimes stay in shelters still. I guess you could say I’m lazy, because at the end of a long day I sometimes don’t feel like setting up my hammock! Nice article Kyle! I’ve kicked around the idea of trying out a hammock. My son bought one recently and I’m anxious to do some hiking in the Whites this summer to check it out. Hey Ralph! Definitely test out the hammock in the Whites. Some people claim it’s difficult to hammock in the Whites, but I’ve never had this problem. I was even able to stealth camp pretty high up after coming down Franconia Ridge one time. Obviously it was below treeline at that point, but still somewhere that would have made setting up a tent difficult. Just make sure if you do this you keep it legal, and don’t forget LNT! Good luck on your hammock endeavors! 1) Set up over durable surfaces, either on a well-used campsite or over rock, snow, grass, or organic leaf litter with few plants. Never set up over broadleafed herbs as these are easily damaged by your traffic. 2) Use only wide straps to protect the tree bark, preferably 1.75 or 2 inchs wide. 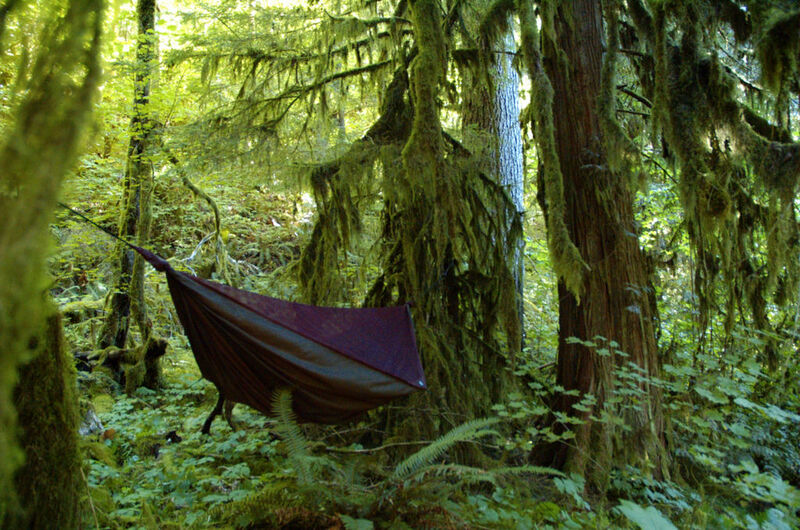 3) Hammocks are great for dispersed “pristine site camping,” select a spot away from trails and campsites and naturalize it before leaving; don’t build a campfire. You wrote: “A loose ridge-line allows for more sag in the hammock.” Actually, a shorter ridge-line will increase the sag of the hammock, but will be tighter. Otherwise, nice article. I’ll emphasize here that HammockForums.net is the best place to learn more than you ever wanted to know about hammock camping. You’re actually totally right Chris, I worded it wrong in the article, I’m going to fix it right now! I am not a hammock hanger, although I do occasionally admit to some minor interest. But I do have to say I am baffled by your claim that sleeping in a sleeping bag creates more condensation on the inside of a tent than sleeping under a quilt. I would love to see some empirical evidence of this phenomenon. Can you provide any? Is there even any anecdotal evidence? I have many tents but the one I use most is my TarpTent Rainbow. Being a single layer tent, I am well aware of what causes condensation, and I cannot even begin to understand how sleeping in one or the other would change the amount of condensation on the inside of my Rainbow on a cool morning. The condensation is primarily caused by the moisture in your exhaled breath condensing when it – being warmer than ambient air – rises, and contacts the cool surface of the tent canopy. How would sleeping under a quilt in any way change the amount of moisture in the air you exhale during the night? Really, I am very interested to know how you will defend this claim??? Hello TicTac! Allow me to address your concern. It partially has to do with personal sleeping habits. When people sleep in sleeping bags, they tend to toss around and end up breathing face down into the hood, or just pull the hood over their head entirely. I am often guilty of this. Since quilts don’t have hoods, this condensation is reduced. Again, it’s largely personal. It’s been a problem for me, and I know of others who have had the problem as well. I guess you just rest better than I! So what about stomach sleepers are there any that are “flat” enough to where you are not bending your back too much? And are three any appropriate for co-sleeping? Hey Kevin! Those are good questions, and I’m sure there are others out there wondering the same things. As far as sleeping on your stomach is concerned, I would say that it’s possible, but it would be a little tricky. Most stomach sleepers I know opt for tents because it’s just easier for them. Many hammocks do allow you to lay completely flat, but I can just see it being tough to consistently sleep on your stomach in one. To address your question about co-sleeping, I have seen hammocks that allow this before, but they’re pretty rare from what I’ve gathered. I haven’t done as much research about hammocks meant for two, so the best advice I can give you is to shop around online, and perhaps read some reviews. If you find out anything interesting, let me know! You can contact me through my Facebook page, there is a link to it underneath my bio and picture on the right hand side of this page. Thanks for chiming in! I’m a side/stomach sleeper. Could not adjust to a standard hammock but I got a Warbonnet Ridge Runner (bridge hammock) and so far is working out. Still dialing a few things in but I’m hopeful this becomes my long term solution and I can put the tent aside. Yes, you can sleep on your stomach in a hammock!!! You need to buy a “bridge hammock” to accomplish that. I am a stomach sleeper and have used a Warbonnet Ridgerunner for 3 years now and would recommend it any day. A bridge hammock gives you a much flatter lay and you can easily sleep on your stomach or your side. It uses spreader bars so you don’t get the pinch at your shoulders either. Ticket To The Moon makes dual sleeper hammocks. I love mine! Great article. Thanks from a newbie. Thanks so much for your praise Jason, I hope I was able to help you out. I just briefly looked at the Ticket to the Moon hammocks, looks good! Can you provide a link to the dual sleeper hammock you were talking about? I’m sure some others would be interested in seeing it. Thanks for reading! Great article Kyle! A great primer. I’m coming out with a new edition of my book that I’d love to send you when it comes out next year. Send me a PM. I’m surprised nothing was said about the “comfort”. As an older dude, sleeping on the ground leaves me stiff with sore contact points in the morning. With the hammock I roll out in the morning ready to go. I have coverted many other older folk too. I am 52 inn good health and fair shape. It’s just one of those older things. Love my eno jungle. I would just add that it takes me about 2 seconds to go to sleep in a hammock. Try that on the ground. I am a stomach sleeper in a bed but have no problems sleeping on my back in a hammock. It is very hard to to near impossible to sleep on you stomach in a normal gathered end hammock. Bridge hammocks do allow one to sleep on ones stomach very easily. My wife loves hers. Most times you will need some sort in insulation under you once the temps drop below 70 degrees. The wife and I started off with pads but quickly found UQs ( Under Quilts ) to be much more comfortable. Best place to learn more about hammock camping is to check for group hangs in your area at Hammock Forums and attend one even if just to visit. My wife and I hold several group hangs a year and always welcome any one who wants to learn more to join us. Yes hammock options are overwhelming! I’m experienced and I still get overwhelmed (e.g. do I want to learn prusick knots?) Luckily I got to experience a Warbonnet Blackbird before purchasing, so that was an easy choice for me. You can (last I checked) get everything in a bundle from Warbonnet. But wait times…. To narrow it down here’s a shortlist of vendors for the things you need: Warbonnet, Hammock Gear, Dutchware, and Enlightened Equipment. Love hanging! Never stiff or sore. In addition to comfort, never had to deal with mice, never been crowded out. So fast to set up that I set up hammock with bug net in middle of the day, take an hour siesta and totally refreshed for rest of the day. Yes it’s a hike, but it’s also a vacation, so enjoy it!